CHICAGO — Ald. Nicholas Sposato (38th), a longtime champion for city employees and organized labor in the City Council, is stepping back from a key role within the Democratic Party, he said Tuesday. The alderman had long planned to resign as 38th ward Democratic committeeman, saying he's long identified as an "independent." But he wanted to line up a replacement before he stepped down, he said. "I'm not really a Democrat and not really a Republican ... but people think you're some kind of freak if you call yourself an independent these days," Sposato said. While Sposato supports Democratic candidates "about 95 percent of the time," his economically liberal, socially conservative politics don't mesh with today's party line, he said. "This definitely isn't the Democratic party I grew up with — it's gone much further to the left," Sposato said. "I make no bones about the fact that I consider myself the most conservative member of the City Council." Ward committeemen help the party, chaired at the county level by assessor Joe Berrios, make decisions on the recruitment and endorsement of Democratic candidates. Sposato called the candidate slating process a "farce," saying he'd rather "focus on my ward and let someone else take care of the political end of it." During its next meeting, the Cook County Democratic Party will take up a recommendation to appoint State Rep. Robert Martwick (D-Chicago) to fill the vacancy, according to press secretary Manuel Galvan. "We appreciate [Sposato's] years of service to the Democratic party," Galvan said Tuesday. Martwick said Tuesday that he plans to accept the new title, adding that "organizing around issues important to Democratic voters is something I've been doing my whole life." Sposato, an early backer of raising the city's minimum wage to $15 an hour, resigned from the council's progressive caucus last December, citing its sharpened focus on "social issues." 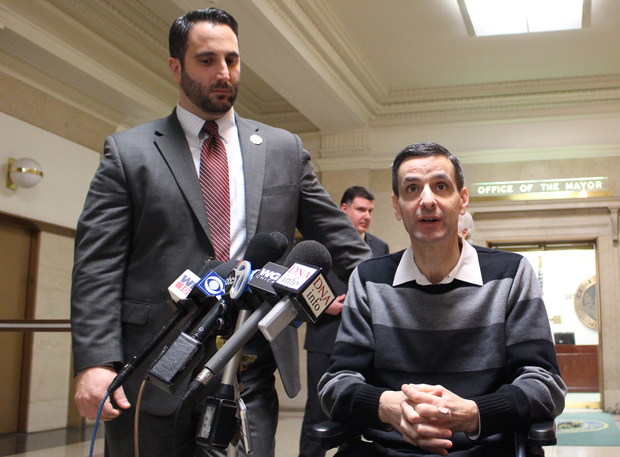 The alderman's multiple sclerosis, which confines him to a wheelchair, had also made devoting time to the caucus more difficult, he said then. In last year's election, 35 percent of 38th Ward voters picked President Donald Trump — the second-highest in the city, records show. Many residents of 38th Ward work for the city. Sposato has joined neighboring Ald. Anthony Napolitano (41st), who identifies as an Independent, in resisting city efforts to shield undocumented immigrants from deportation. Both former firefighters, the aldermen have organized "Police Lives Matter" rallies and criticized tightened scrutiny of the Chicago Police Department. Sposato said Tuesday that he "100 percent" plans to run for a third aldermanic term in 2019, but that would likely be his last election. "This is a demanding, stressful job, and I don't want to be one of these old guys who keeps going on with it," Sposato said. "But it's hard to just walk away when there are a lot of good things going on that I want to see completed."